The concept for a high-tech deer-alert system that could make nighttime driving safer will be on display in the Gordon Field House during Imagine RIT on May 3. The cohort of imaging science Ph.D. students finishing its first year in the Chester F. Carlson Center for Imaging Science will exhibit a deer-alert system at Imagine RIT on May 3. Shown in the top row, left to right, are Doug MacDonald, Kamran Binaee, Brittany Ambeau, Kevan Donlon, Viraj Adduru, Zichao Han and Yue Wang. In the bottom row, left to right, are Justin Harms, Utsav Gewali, Jie Yang, Yansong Liu, Osborn de Lima, Kelly Anderson, Zhaoyu Cui, Shusil Dangi, Lauren Taylor and Colin Axel. Not shown is Chi Zhang. First-year Ph.D. students in the Chester F. Carlson Center for Imaging Science built a long-range infrared dual camera system to warn drivers of deer in their vicinity. The project was assigned to the cohort with the Imagine RIT: Innovation and Creativity Festival on May 3 as a deadline. Working in teams, the students designed and built a system to see in the dark and warn the driver of nearby deer. Their proof of concept—tested on a big truck—integrates subsystems that collect data with thermal infrared cameras, process the imagery and communicate the proximity of deer within a quarter mile of the vehicle. The system begins with two thermal infrared cameras mounted on top of a vehicle. The cameras, pointing in opposite directions, read information at far infrared wavelengths and detect heat given off by living things. “Hot” signatures are juxtaposed to the “cool” fingerprints of trees, buildings and other inanimate objects in the surroundings. The students’ algorithms process images capturing heat from the deer’s bodies. These hot areas in the image are extracted from the background and matched to the templates of deer images the students created. If there’s a positive match, the deer’s location is passed to a communication system comprised of speakers and 12 lasers mounted on the back of the vehicle with corresponding reflective dots on the windshield. 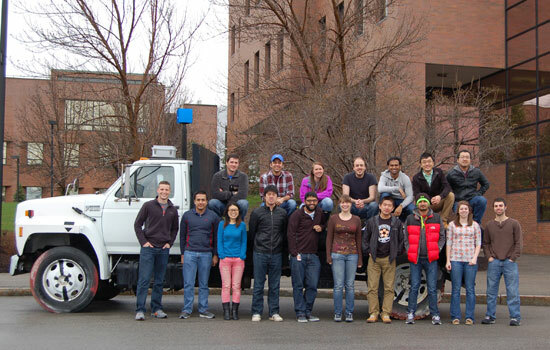 The cohort of imaging science Ph.D. students who worked on the deer-alert system includes Doug MacDonald, Kamran Binaee, Brittany Ambeau, Kevan Donlon, Viraj Adduru, Zichao Han, Yue Wang, Justin Harms, Utsav Gewali, Jie Yang, Yansong Liu, Osborn de Lima, Kelly Anderson, Zhaoyu Cui, Shusil Dangi, Lauren Taylor, Colin Axel and Chi Zhang.